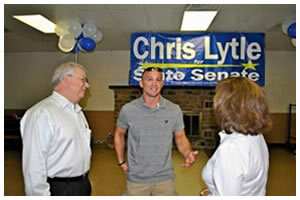 Lytle was born in Indianapolis, Indiana and graduated from Southport High School in 1993. At Southport, he was an active member of the wrestling team. In fact, to this day, he still participates in workouts at the Southport High School with the wrestling team, Coach Petty and Coach Dildine. Lytle attended Indiana University where he achieved a degree in Sports Management. Lytle started training for fighting in 1998, saying that it was "something to keep me active". He trains part-time outside of his regular job as a firefighter, attending single-discipline gyms rather than MMA camps. He has held championships in the Hook N' Shoot and Absolute Fighting Championship promotions and won the Cage Rage World Welterweight Championship. He became the 175 lb Indiana state boxing champion, saying, "By the end of the year (2004), I think I'll have a few more smaller boxing titles." In 2006, Lytle was a contestant on The Ultimate Fighter 4 on Spike, where he defeated Pete Spratt and Din Thomas in exhibition bouts to proceed to the welterweight finale. On November 11, Matt Serra defeated Lytle by split decision in The Ultimate Fighter 4 Finale. Lytle was the more active fighter on the feet, with Serra tying up and using foot stomps until he got takedowns, at which time he became the more active fighter, with Lytle holding guard and seemingly waiting for the referee to stand the fight up. Two judges scored the bout 30�27 for Serra and one judge scored the fight 30�27 for Lytle, but despite the scores the match was very close. He lost to former UFC Welterweight Champion Matt Hughes on March 3 at UFC 68 in Columbus, Ohio via unanimous decision. Lytle was expected to face Kim Dong-hyun on February 21, 2010 at UFC 110. This fight was later cancelled after a knee injury to Kim. Lytle instead faced Brian Foster at UFC 110 and was victorious via first round submission (kneebar). Lytle defeated Matt Brown on July 3, 2010 at UFC 116 via straight armbar/triangle choke in a rematch from 2007. The submission was very technical and was a strong contender for yet another Submission of the Night bonus, but said award was won by Lesnar for the surprising arm triangle choke on Carwin�a choice that created minor controversy among fans. Although not another official fight bonus, Lytle was later awarded an undisclosed bonus for managing another exciting finish. Lytle faced former UFC Welterweight Champion Matt Serra on September 25, 2010 at UFC 119 in a rematch of their 2006 bout at The Ultimate Fighter 4 Finale which he won via unanimous decision, out striking Serra through out all three rounds. Lytle was expected to face Carlos Condit on February 27, 2011 at UFC 127.However, Condit was forced from the bout after suffering a knee injury while training and replaced by UFC newcomer Brian Ebersole. Lytle lost to the UFC newcomer via unanimous decision (30-27, 29-28, 29-28), again winning fight of the night. Lytle faced former UFC welterweight title contender Dan Hardy on August 14, 2011 at UFC on Versus 5. 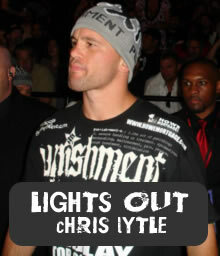 Chris Lytle stated he would retire after the bout regardless of the outcome. Lytle was able to close out the fight with a Guillotine choke submission in the 3rd round over Dan Hardy after being successful early on by utilizing his superior boxing, thus closing out his MMA career with a victory and 10-10 record in the UFC. Lytle walked away with Fight of the Night and Submission of the Night honors, and earned a 2012 Softail Blackline motorcycle from Harley Davidson for the performance. 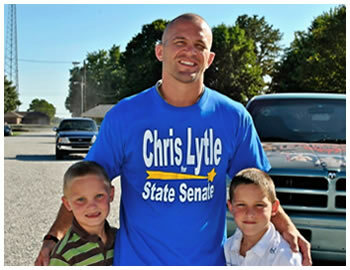 Lytle is married to Kristin and has four children. He works full-time as a firefighter at the Indianapolis Fire Department in addition to his fighting career. 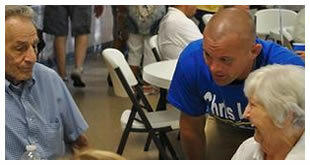 He is currently preparing to run in 2012 for the Indiana State Senate in District 28.